USAC issued Wave 29 on Thursday, October 25th. Cumulative funding as of Wave 29 is $1.86 billion. The FY 2019 administrative window is open and will remain open until roughly January 7th at which point EPC entity profiles will be locked for the duration of the Form 471 application window (estimated to be January 10th – March 20th). USAC will be conducting a webinar on Updating Applicant Profiles on November 20th. Given the importance of today’s invoice deadline for FY 2017 recurring services, it’s appropriate to remind users of the interrelationships between the various USAC IT systems. User entries in one system do not necessarily carry-over, at least not immediately, into other systems. Applicants who have recently submitted Invoice Deadline Extension Requests (“IDERs”) using the new EPC tool, for example, have been reporting two to three day delays before the extended deadlines are reported in the FRN Status Tool (“FST”). Because the FST provides the most comprehensive source of FRN data for FY 2016 and forward, delays in database synchronization at or around critical deadlines can be at best disconcerting. Currently the tool appears to be listing the service delivery and invoice deadlines for all FRNs in FY 2017 and FY 2018, not just the FRNs with extended deadlines. When using the FRN Extension Table, therefore, it is important to check the actual “Last Allowable Date for an Invoice to be Submitted” (Col. 3) to confirm that an IDER has been approved. October 29 Invoice deadline for FY 2017 recurring services. Note: For applicants and service providers unable to submit invoices by this date, October 29th is also the deadline for filing 120-day Invoice Deadline Extension Requests (“IDERs”). Note: The FCC has granted special invoice deadline relief (DA 18-1101) for schools and libraries in Florida and Georgia that are in areas affected by Hurricane Michael. The action automatically extends the October 29th invoice deadline to February 26, 2019 (whether or not it was separately requested) and makes those applicants eligible to request another 120-day invoice deadline extension if necessary. October 29 FY 2018 Form 486 deadline for funding committed in Waves 1–12 (all issued before July 1st). Note: Applicants missing any Form 486 deadline should watch carefully for “Form 486 Urgent Reminder Letters” in EPC. These Reminder Letters afford applicants 15-day extensions to submit their Form 486s without penalty. November 1-2 Next in the series of USAC annual fall training workshops, this one to be held in Sacramento, CA. November 13 The first of three special E-rate Tribal training workshops to be held by USAC will be held in Omaha, NE. Dates for the next two (Farmington, NM, and Spokane, WA) have not yet been announced. November 20 USAC webinar on Updating Applicant Profiles in EPC. 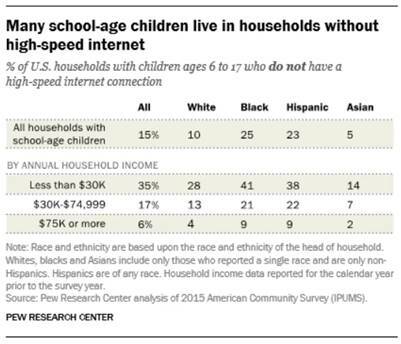 FCC Commissioner Jessica Rosenworcel highlighted a new study by the Pew Research Center indicating that nearly one-in-five teens can’t always finish their homework because they do not have home access to high-speed Internet access. As shown below, Pew’s data indicates that this “homework gap” disproportionally affects lower-income black and Hispanic students. Last week’s EPC 101 for Applicants, now available online. Updating Applicant Profiles in EPC scheduled for November 20th (noted above). Preparing for Funding Year 2019 scheduled for December 12th. An announcement of the first of three Tribal training workshops (noted above). An FCC order granting invoice deadline relief for Hurricane Michael applicants (noted above). A notice to service providers using the E-File system that Internet Explorer version 10 will no longer be supported as of November 1st.